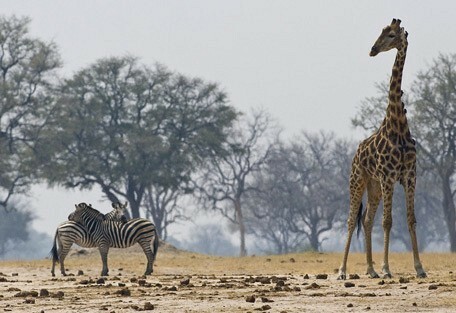 Hwange National Park is the largest park and protected area in Zimbabwe, offering diverse habitats and vegetation types. 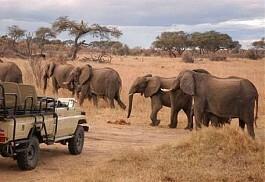 Hwange National Park is famous for its large concentrations of wildlife, particularly elephants. Hwange National Park is located in the far west of Zimbabwe on the border of Botswana and is the largest park and protected area in the country at approximately 14 500 km² in size. The Park supports enormous species diversity and provides an authentic safari experience with an abundance of wildlife and fantastic birdlife. 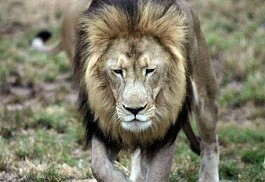 Hwange National Park is situated on the eastern edge of the Kalahari Desert. The area is dry and water is scarce during the winter months, so there are a number of pumped waterholes to sustain the wildlife. The wet summer months provide afternoon thunderstorms and the park is turned into a lush green haven. A variety of plains game, including blue wildebeest and zebra migrate here and give birth to their young during this time of year. Hwange is an important element to wildlife conservation in Southern Africa, as well as neighbouring countries like Botswana and Zambia. 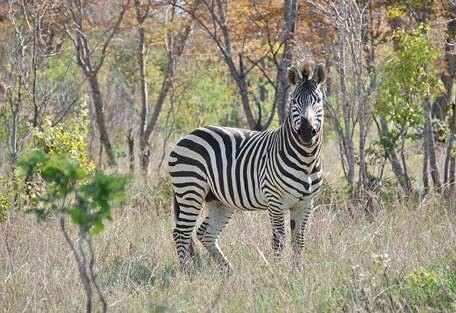 Hwange National Park used to be known as Wankie Game Reserve, named after a local chief. Today it is Zimbabwe's biggest park and protected area and receives a lot of conservational help from the ministry and safari operators. This park is included in the 5 nation Kavango-Zambezi Transfrontier Area (KAZA), which focuses on opening old animal migration routes in the largest conservation area in Africa. 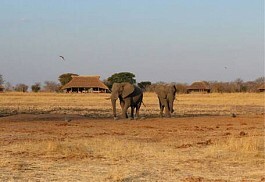 Hwange is known to host one of Africa's largest populations of elephants, especially in the 1980s. It is widely known for its diversity of species, including over 100 mammal species (of which a number are endangered) and 400 bird species. There are a variety of camps and lodges in this special park, ranging from affordable to luxurious, catering for all sorts of clientele. 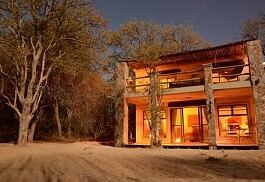 This is a must-see destination in Zimbabwe and fits perfectly into a Vic Falls and Botswana safari. Somalisa Camp offers a unique location on an island along the edge of an ancient seasonal flood plain in the Hwange National Park providing spectacular scenery, incredible wildlife viewing and a remote and traditional bush experience. Somalisa Acacia is set in the heart of Hwange National Park, under the canopy of a grove of acacias on the western side of its well-known sister camp, Somalisa. It is a charming, small exclusive camp that caters for small family groups (up to 8 people) and those requiring a private experience. Tom's Safari House is a new establishment that was recently opened in celebration of The Hide Safari Camp’s 20th Anniversary. Run by the same owners, this accommodation option is family-friendly and operates on an exclusive basis for the privacy of groups. Camelthorn Lodge overlooks small waterholes where guests can observe wildlife, feed birds and attract smaller woodland creatures such as bushbuck, duiker, mongoose and squirrel. Khulu Ivory - “Grandfather of Ivory” - is located on a private concession of 6,000 acres. The beauty of this camp is that it combines luxurious and private accommodation with old world hospitality. Hwange airport only 8 kilometers away. The remoteness of Little Makalolo forms part of its many highlights; with only 6 luxurious en-suite rooms offering incredible views of the surrounding plains, Little Makalolo promises to offer a personal and unique safari experience. Makalolo Plains Camp is without a doubt one of the finest camps in the Hwange National Park. The camp offers privacy and exclusivity in a private concession with no other guests or safari vehicles around. Incredible variety of wildlife and close encounters. Linkwasha Camp is a new classic camp which opened in May 2015. In the private Linkwasha concession the camp is near the Ngamo Plains, ensuring fantastic year round game viewing. 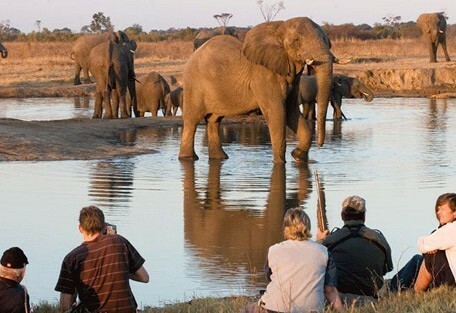 Nehimba Lodge is located in a private concession in Hwange National Park and is frequented by elephants, which arrive to drink from either the pan in front of camp or from the plunge pool. Four to five hours drive from Victoria Falls through the park. 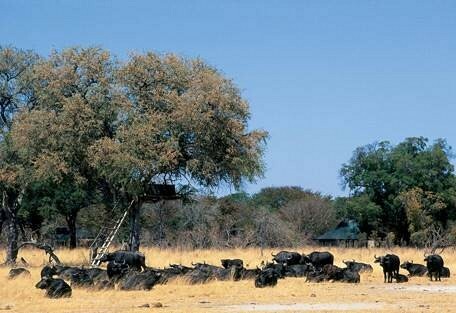 Camp Hwange is a classic safari camp on Sinamatella private concession in the north of the Hwange National Park. 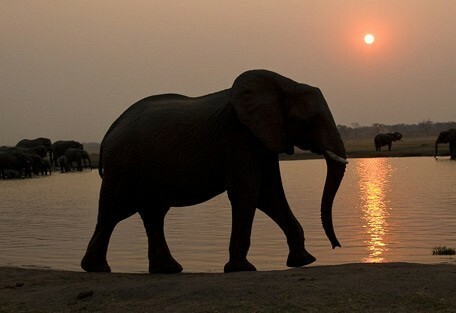 This is Zimbabwe’s largest park and is one of the best places in the world to view huge numbers of elephant. Situated inside the Ngamo Forest area, Bomani is located within our 5,000-acre remote private reserve: only 1.5 kilometres away from Ngamo’s gate to Hwange National Park. The generally dry, expansive plains are dotted with natural water pans and Ilala Palms. Elephant's Eye, Hwange is situated 13 km from the entrance to Hwange National Park in Zimbabwe, on a private concession of 2500 hectares. The lodge is a truly eco-style lodge offering a unique barefoot luxury experience. 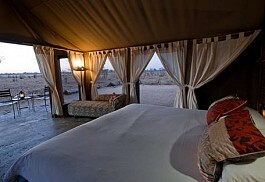 The Hide's emphasis is on high quality guiding, comfortable accommodation and gourmet cuisine in a relaxed environment. 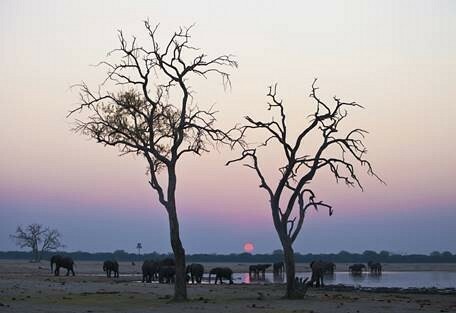 Hwange National Park is one of southern Africa's finest game parks and offers guests 14 650 km² of prime wilderness. In the southern Hwange lies the rustic Jozibanini Camp, surrounded by wilderness and fantastic game! Far off the beaten track, Jozibanini's rustic tents are on raised decks offering great views over the waterhole. Davison's Camp is a traditional safari camp offering tented accommodation and provides a location known to be one of the best in Africa for wildlife viewing. With secluded units situated underneath the trees, the camp offers a peaceful location with spectacular views. 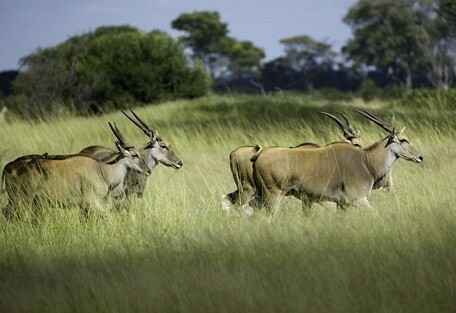 Hwange National Park is famous for its large concentration of wildlife during the winter months. There are a number of pans throughout the Park offering drinking water where wildlife congregates, making for incredible and consistent game viewing. During the summer months when plains game migrate onto the lush park to give birth to their young, predators follow suit as they look out for easy meals. 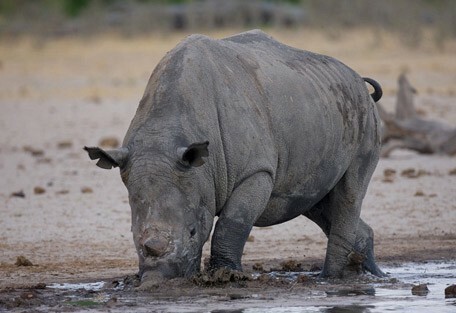 Wildlife in the park includes elephant (to a large extent), Cape buffalo, sable, roan, southern giraffe, blue wildebeest, impala and occasionally gemsbok, which are specialised to the dry winters. Hwange National Park is one of the best in Zimbabwe for predators, as lion, leopard, wild dog and cheetah are regularly seen, along with the smaller African wildcat, serval, honey badger, civet and spotted hyena. The park is a bird lover's haven with more than 400 species found. 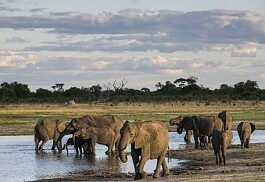 Hwange is well-known for its massive herds of elephant and buffalo. 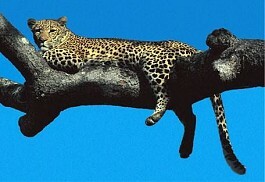 Hwange experiences a mild to warm climate, even in winter, when the temperatures are fair and pleasant. The warmest months are September to March, while May to August is the coolest. The dry season corresponds with winter, which runs from April to October and brings fine weather (26 degrees Celsius), however, early morning game drives will be chilly and night time temperatures can drop to below 10. Mid-winter is very dry and dusty, but animals are regularly spotted at waterholes. The wet season occurs from November to March and comes in the form of afternoon showers followed by clear, sunny sky. It can sometimes lightly shower over days at a time, beginning in September, which breaks the dry winter and brings new vegetation into leaf. Temperatures in mid-summer can peak to 40 degrees Celsius. Little Makololo Camp is a small and intimate safari camp offering a private and secluded location in the immense Hwange National Park; one of Zimbabwe's premier wildlife destinations. In addition to normal safari activities, the camp has an excellent waterhole hide. Somalisa Camp offers elegance and romance in a private location in the midst of the Hwange National Park. This quaint safari camp offers only 6 canvas safari tents overlooking the vast plains promising spectacular views. 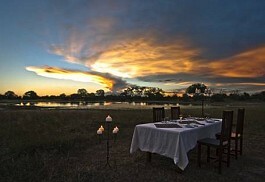 The Hide is renowned for its fantastic location in Hwange National Park, its gourmet cuisine and high quality guiding. The emphasis at this unique safari camp is on offering guests a personalised safari experience. 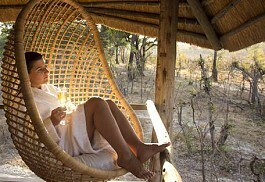 Davison's Camp offers a magnificent location in the private Linkwasha Concession in south-eastern Hwange National Park. The tents are luxurious and situated on the ground with ensuite bathrooms, as well as verandas that overlook the waterhole in front of the camp. 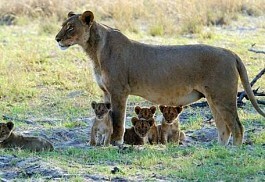 Hwange National Park is located in the far west of Zimbabwe, on the border with Botswana and close to Victoria Falls. 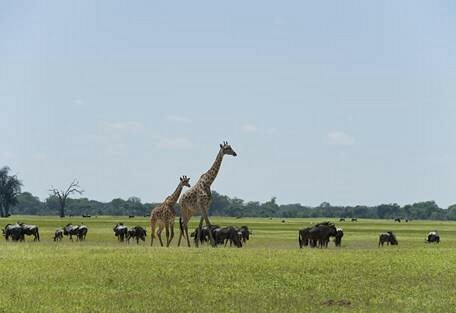 To embark on a safari in Hwange, Sun Safaris will arrange for guests to fly to Victoria Falls Airport (Zimbabwe). Upon arrival, guests will connect with either a chartered flight, which will fly guests to an airstrip in Hwange National Park that is closer to their booked lodge; or they will embark on a road transfer from Vic Falls Airport to their lodge in Hwange; or, if guests will be driving themselves on a Hwange safari, they will pick up their hired car. During the wet summer months, self-driving is not recommended and a 4WD is required, so Sun Safaris would rather arrange all means of transportation for guests to reach their lodge accommodation.